EEC, as a leading manufacturer of DPF’s and catalytic converters are proud to launch, to our global customer base, the new 6 in 1 petrol solution to complement our industry leading 6 in 1 DPF (Diesel) solution. The new 6 in 1 petrol solution has been designed to keep every component carbon free e.g. the fuel injectors, inlet/exhaust valves, turbo, EGR valve, glow plugs, and reduces smoking. With all new petrol cars being fitted with a (GPF) Gasoline Particulate Filter from this September, following EU guidelines, our new 6 in 1 Petrol Solution has been designed to assist the regeneration of the GPF. Just one bottle can be used for over 400 litres of fuel, with each 25ml ’shot’ increasing power and acceleration, cleaning the engine system, lowering emissions and combating the corrosion effect from ethanol (E10) fuels. The product will also help motorists with older and classic cars who could suffer from the corrosion issues should E10 ‘green-petrol’ biofuel be introduced in the next few years, as well as unleaded fuel which already contains up to 5% ethanol. EEC Petrol 6-in-1 Solution is a fuel borne catalyst formulation that cleanses all of the fuel and emissions system which restores an engine to optimum performance. It is also designed to regenerate a GPF by reducing the natural combustion temperature required to burn off the trapped particulate matter (un-burnt carbon, engine oil debris and soot) by up to 150c. One of the main problems which makes older and classic cars incompatible with E10 is corrosion. Ethanol is hygroscopic which means that it absorbs water in fuel storage tanks and from condensation which can then cause rusting in parts of the fuel system where the metallurgy is less resistant. Once oxidised, ethanol itself can become corrosive. EEC’s new 6 in 1 Petrol Solution has been formulated with the new challenge of E10 in mind. It contains a corrosion inhibitor proven to work in petrol containing ethanol. The detergent additive system has been thoroughly tested in E10 petrol and is highly effective is removing deposits from fuel injectors and inlet valves (and carburettors in the case of classic cars). 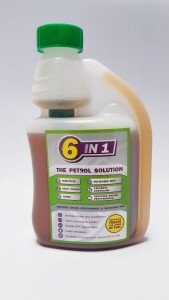 Given that even standard unleaded petrol now contains up to 5% ethanol, the regular use of 6 in 1 Petrol Solution will help to protect all cars including those classified as incompatible with E10 Petrol. Scientifically developed by leading experts and rigorously tested, the new EEC 6 in 1 Petrol Solution is suitable for all types of petrol engine.